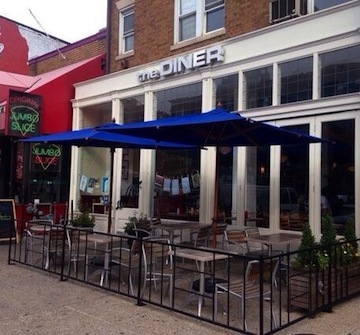 the DINER | Gluten Free D.C.
My goal is to discover gluten-free food in the District to make your gluten-free diet easier. 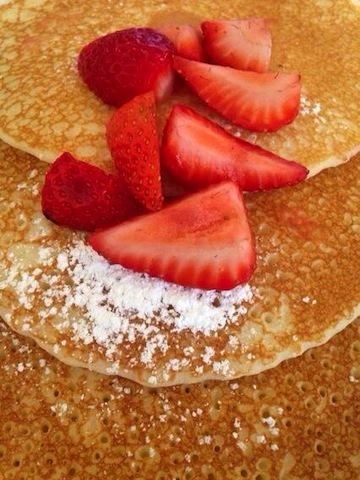 What I got: Gluten-free pancakes topped with fresh strawberries and powdered sugar. Not the best I’ve ever tasted, but gluten-free pancakes is a tough food to get right. Plus, you can always drench them in a sea of maple syrup and butter. Gluten-free friendliness: It’s fairly easy to find gluten-free breakfast food options (think anything with eggs), but it is rare to come by alternatives for brunch staples like pancakes and french toast. This is where the DINER scores big points. For lunch or dinner, you’re looking mainly at salads for gluten-free options. Overall vibe: the DINER has a modern feel with a touch of vintage. The big booths that line the wall are practically begging you to splurge on brunch with a group of friends. If you do head over on a weekend morning, be prepared for a bit of a wait. The friendly staff and delicious food are no secret. This entry was posted in Adams Morgan and tagged Adams Morgan, Brunch, GFDC, GlutenFreeDC, GlutenFreeDiet, GlutenFreeFoods, Pancakes, WashingtonDC. Bookmark the permalink. Pingback: Tryst | Gluten Free D.C.